As housing demand has been coming up, the inventory of homes for sale on the market has been going down. This tightening of supply relative to demand is the bedrock of the recovery. It gives consumers confidence and a sense of urgency to buy. Those interested in the course of home prices should watch inventory levels, especially relative to demand. Multiple listing services (MLS) provide measures of inventories at the metropolitan level and typically even for submarkets within them. If you start to see inventories in a market climb, the recovery in prices—and demand which is partly linked to the urgency created by rising prices—may not stay on course. In assessing housing market recovery, then, an important question is what is in store for inventories of homes for sale. Will demand at some point be outstripped by inventory growth as new home building ramps up again and more existing owners place their homes on the market because of rising prices? The answer to this question of course will hinge on conditions in individual housing markets. Broadly speaking, the dynamics will likely differ depending on the share of homeowners in a market who are underwater and the activity of investors in single-family rental properties. 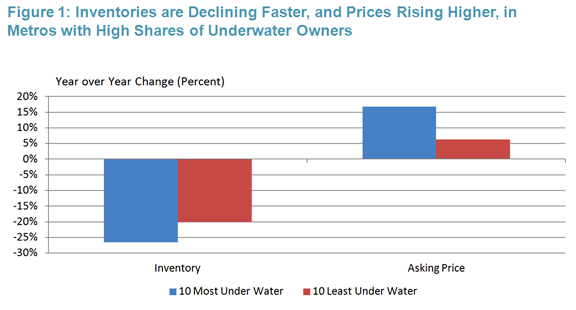 In places where only a small fraction of homeowners are underwater, rebounding homes prices may be enough to spark owner interest in selling their existing homes to trade up or down. With interest rates so low and the potential to move unfettered by negative net equity, many may start to feel that now is the time to sell. In places where many owners are deeply underwater, however, even a strong single-digit increase in home prices may not be enough to induce many owners to place their homes on the market. After all, they would still have to write a check at the closing table if they did. Therefore, one would expect inventories to fall more in places with negative net equity as demand picks up because homeowner interest in selling does not follow suit. In fact this is precisely what seems to be occurring. 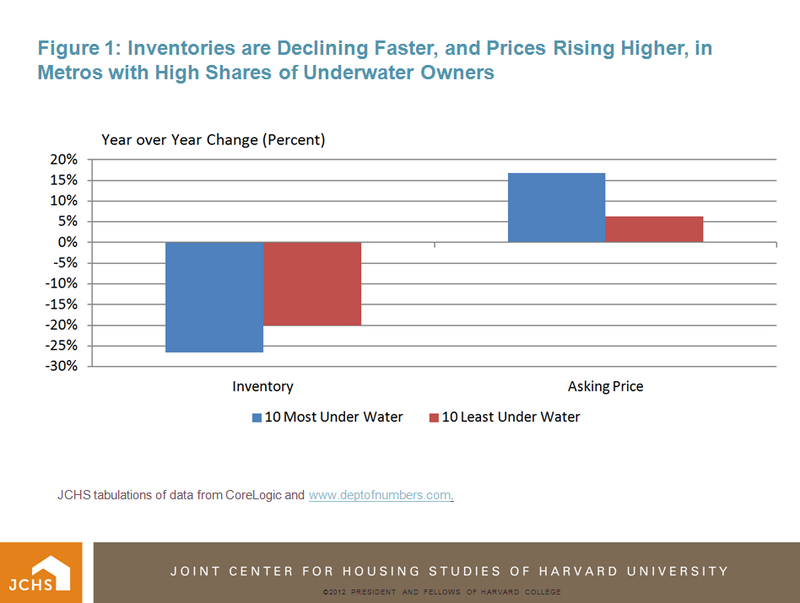 Inventories have fallen more sharply and asking prices risen more in areas with more underwater homeowners (click figure to enlarge). However, the buyers of these homes are not necessarily individuals looking to move. In many of these places much of the demand has come from investors who snapped up homes at low prices and then rented them out. 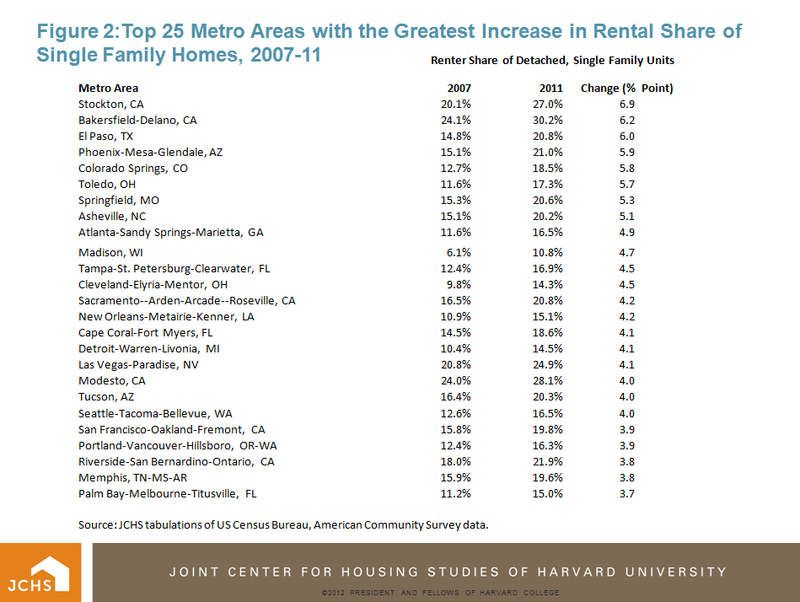 Figure 2 lists places where there has been a significant shift in the share of single-family homes that are rented. 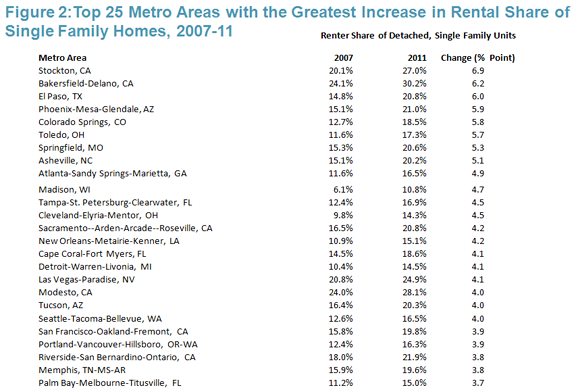 These are the markets where investors have been most active, helping to soak up the excess supply of distressed homes. Source: JCHS tabulations of US Census Bureau, American Community Survey data. Moving forward, it is therefore not just what homeowners in these places do that matters but also what investors will do with recently acquired single-family properties they are currently renting out. Many will look for a chance to exit their investments when prices appreciate enough to make it worthwhile. For investors in distressed markets, the run-up in prices from the trough is pure upside. Many may head for the door at about the same time, especially if they discover that it is both more arduous and costly to manage scattered-site, single-family rentals than they had anticipated. If enough investors in any of these markets start to head for the door to try to gain from capital appreciation, home price appreciation could slow. So to predict where prices may be headed, keep your eyes on investors and what they are doing. Local realtors will see the first signs of activity in homes now rented shifting back to the for-sale market. Seek them out and find out what they are seeing.